The cookies smelled like nothing, like air, and that’s how they felt inside her, too. They never filled her up, no matter how many she ate. Once, at night, when she was certain everyone was in bed, she had eaten two boxes of the cookies, just to see what would happen, and it had done nothing to her. Edie couldn’t feel a thing. For a book about obesity, it’s surprisingly light on social commentary, which actually works to Attenberg’s benefit. She has instead opted to write an intimate family drama, specific in its circumstances but universal in its problems. The Middlesteins is enjoyable throughout, but the final 50-ish pages set up one of the year’s most heartbreaking conclusions. TL;DR: A funnier, shorter Jonathan Franzen novel — wait, what? Set firmly in present-day San Francisco, Web designer Clay Jannon finds himself working at a peculiar bookstore where the patrons are few and the purchases they make are even fewer. Out of boredom and curiosity, Jannon starts charting customer purchasing behavior, which sends him down a rabbit hole that involves chasing down the mysterious book shop’s mysterious owner, Mr. Penumbra, a secret society called the Unbroken Spine, and a heist that involves a cardboard book scanner designed by Google. 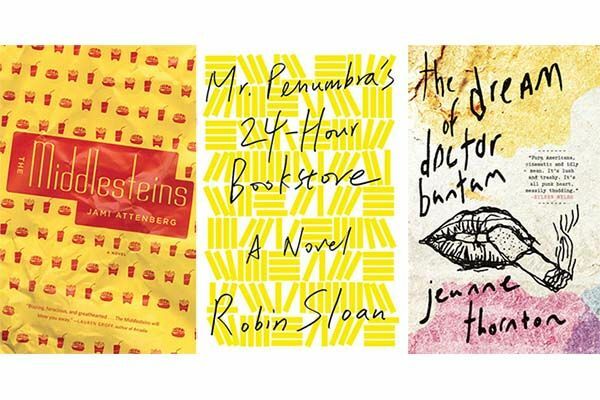 Though Mr. Penumbra isn’t technically science fiction, its best ideas and themes certainly have a lot to say about technology and the future. Sloan is deeply interested in the tension between print and digital books, and more broadly, embracing the old and the new. Ever the optimist, Sloan believes these things can coexist, a refreshing perspective from the zero-sum-game perspective of most book futurists. Still, Mr. Penumbra does show some common weaknesses of science fiction, which often values ideas over storytelling. We never get a sense of Clay Jannon’s character, other than that he is enthusiastic and curious, and his relationships with Mr. Penumbra and his friends lack tension or complication. These felt like minor flaws, though. Sloan isn’t just exploring new ideas, but laying the groundwork for a new genre of literature. While the influence of Neal Stephenson and William Gibson is present, Mr. Penumbra is something all its own: a technocratic adventure where every riddle and puzzle is solved with very real gadgets, a humanizing reflection on technology that evokes the tone of a fairy tale, a brisk and brainy story imbued with such confidence that it will leave you with nothing but excitement about the things to come. TL;DR: Imagine if Indiana Jones spent less time hunting treasure and more time in Google Docs. It was a strange coincidence that I finished The Dream of Doctor Bantam on the same day that I saw The Master. Both Jeanne Thornton’s debut novel and P.T. Anderson’s latest film feature Scientology-like cults wrapped around unconventional love stories. There is also something common between the disturbed, restless spirit of Joaquin Phoenix’s Freddie Quell and Thornton’s central character, Julie Thatch, a hardened teenager whose sense of direction is shaken after her older sister’s suicide. There’s a discomforting tension that runs throughout The Master. Its saturated palette and Jonny Greenwood–composed score give the film a consistent tone that’s hushed and at the same time distressing. Doctor Bantam feels the same way. It’s a slow, dissonant burn of a novel, a haunting meditation of young, wayward love. TL;DR: A coming-of-age tale about Scientology and lesbians. Kevin Nguyen (@knguyen) is an editor at The Bygone Bureau. His writing has also appeared in The Millions, Kill Screen, and Thought Catalog.